Ragi breads have been quite frequent in my home since I started baking them. I experimented a lot with different blend of flours and using water, milk, buttermilk and whey etc to see how the bread gets softer. 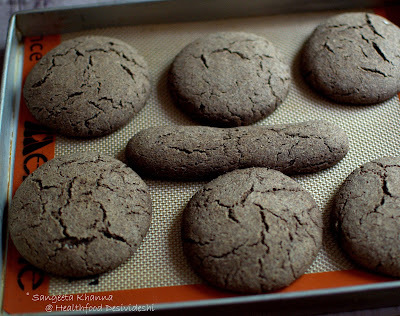 The taste was always appreciated well but the texture needed to be better when I started mixing millet flours with ragi. The blend that worked best till date was a mix of whole wheat flour, ragi flour and potato flour (or potato flakes). I have been repeating this exact recipe since the balance of texture and taste is the best to our taste. The bread needs warming up in the microwave or toasting lightly on a griddle, we used it with our soups, hung curd dips, egg scrambles and for making desi burgers using shami kababs that I make. 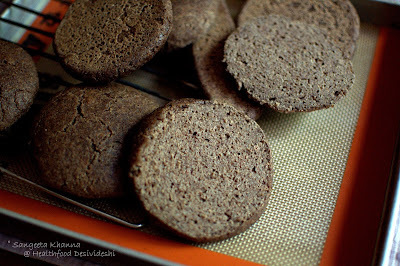 Ragi also makes nice chapatis for sure, we love the ragi dosa, ragi uttapam and ragi idli as well and I have been making a ragi savory kanji (congee or savory porridge) which is very tasty. The ragi cake has become a favorite of many people I know. 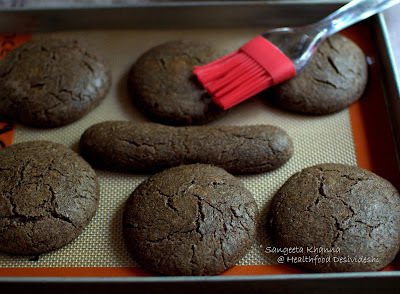 I have experimented a lot with ragi crackers too but that has always evoked mixed reviews by people as ragi is a bit sandy in dry form. Once cooked in moist form, ragi becomes a nice and soft texture, especially when warm. So reheat the bread always. 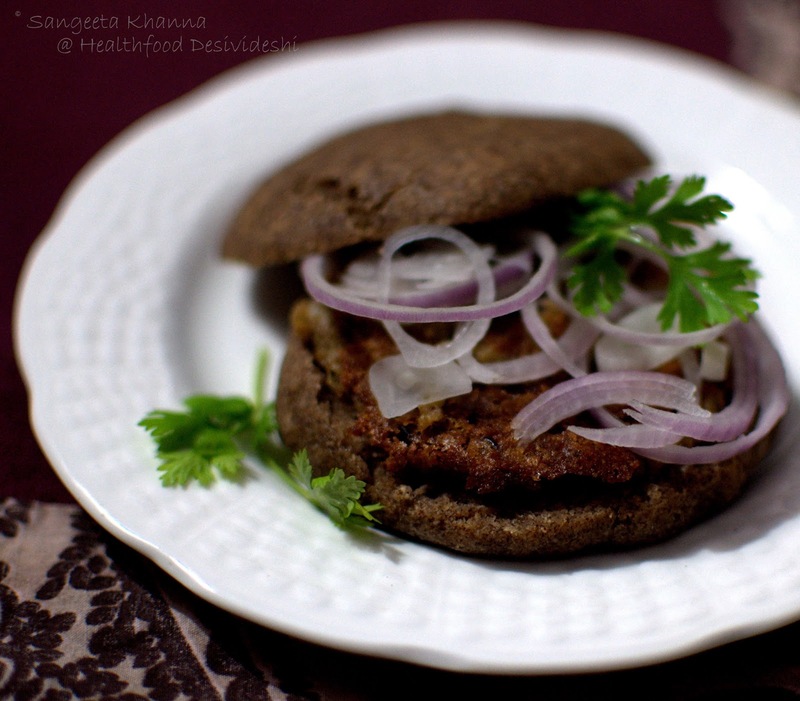 And do not expect a high dome on the ragi burger buns. Better call them pita instead. Minimal gluten buns have to be in their own league. 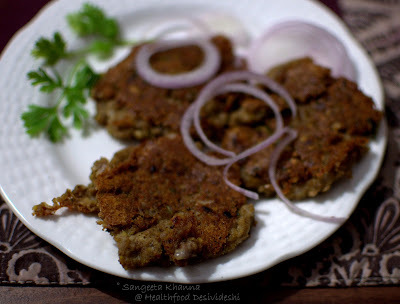 And before we move ahead, these mutton mince patties are actually awadhi shami kababs that keep repeating in my household. Sometimes I make them a bit firm by drying out the mince mix and sometimes I let them be a bit crumbly and melting type. See what I mean.. 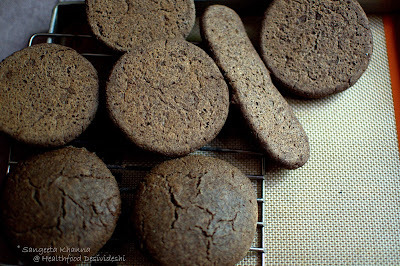 The recipe of the ragi bread is not complex I would say. But one needs a basic understanding of bread baking to start with. Reviving the yeast, proofing it, kneading the dough well, punching it and then shaping the bread and letting it rise again before baking. What? This makes your head spin? Don't worry. I have a step by step picture for you to understand and will explain in layman terms. I used a cup each of ragi, whole wheat and potato flakes/flour. You can change the proportion a little bit but not too much, taking care to not increase the potato flour by volume or not to pack it tightly in the measuring cup. So for three cups of total flour I used 2 tsp of dry instant yeast, 1 tsp salt and 1 tsp sugar. I used about 2 cups of lukewarm whey that is left after making homemade paneer. First add the yeast to the whole wheat flour and add salt and sugar. Add a cup of warm whey (lukewarm, a little higher than body temperature) to the mix and whisk well. Let this mix rest till you see bubbles appear and then get frothy. Add the ragi flour and then the potato flakes and knead a soft dough using more lukewarm whey. Let the dough rest till it increases in size. It gets about doubled in volume. Knead the dough again and shape flat buns, pressing down with your fingers. The leftover dough is shaped into a tiny cylinder here, this one makes miniature slices of bread for our soups sometimes. Bake the bread in preheated oven at 200 C for about 35 minutes. The buns looks lighter in color and get dry on the surface. Cracks appear if you haven't made slashes on the bun. It's normal, don't worry. Brush melted butter of ghee over the hot buns and let them cool on a wire rack. You would notice the buns have browned a bit both on the base and on top, but it doesn't get noticed owing to the dark color of ragi flour used. You can cut the buns across when completely cool. It is a dense bread but the taste and texture is very good. I love it with hummus and lentil soups more. Some sticky egg scramble slapped over it works nicely too. 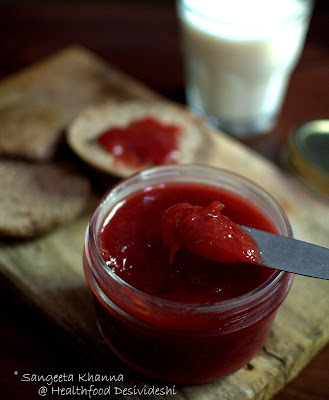 Arvind loves it with any jam that I made recently. This is a plum and vanilla bean preserve that I had in the fridge. He is totally happy with a sweet breakfast while I am all for a savory breakfast if I am having any. My breakfast gets skipped many times and I have a heavy brunch instead. Working from home gives you much freedom but makes your routine go haywire most of the time. I keep ruining my sleep cycle often and then correcting it just to again screw it up. Life goes on. I recently baked 2 cylindrical loaves of this bread and toasted thin slices as I fried kababs on the pan. The toasted slices of this bread were loved with the kababs, a hung curd and garlic dip and some sliced onions and green chutney on the side. Simple pleasures of life can be healthy too. You don't have to depend on all things white flour any more. Especially white bread I say. Edited to add : I baked this bread twice again using boiled potato puree instead of potato flakes and the result was much better. The bread gets softer when reheated in microwave just before serving, a practice I suggest for all whole grain-minimal gluten breads. Use 150 gm peeled, cubed potatoes boiled with 2 cups of water till they start disintegrating, cool and puree. Use this puree to knead the dough, whey wouldn't be required if using this potato puree. 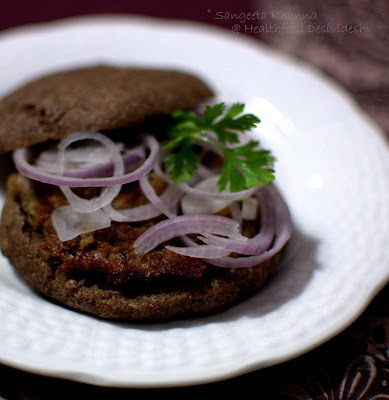 I just loved this ragi bread and not to forget, the melt-in-your-mouth kebabs and that amazing hung curd dip. Nothing fancy, but everything right on the spot! And it is all my pleasure!!! this is one bread i may try....but what is potato flakes/flour and where would i get it..and by whole wheat, you mean atta?? Yes sushmita. Whole wheat is atta that we use to make rotis. And Potato flakes or flour is available by the name of aloo mash in the markets. 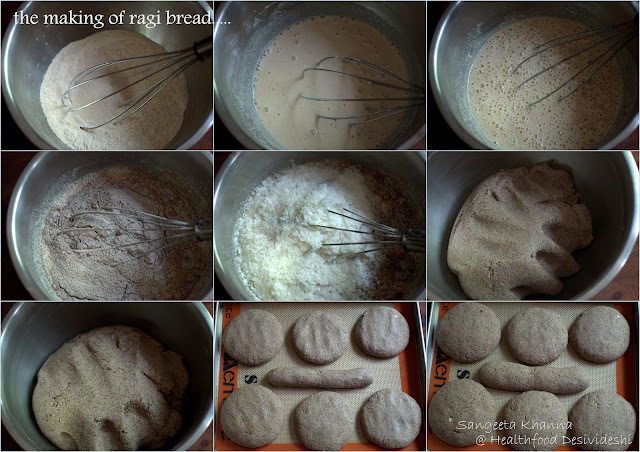 great idea of using ragi for bread . I am new to bread baking and have managed some decent atta breads (mixed with methi leaves etc ) but I always get the texture dense ,any suggestion to make them fluffy and softer? Also, pl do post the recipe of falafel (I am taking a cue from Shweta ). Thanks Kirti. Yes I have been planning the falafel too, few pictures are there in my folders already. Will try and post soon. hey Sangeeta, i am so inspired to try my first bread with ur recipe.. but one question where do u get potato flour, any place in Delhi? or alternative? Or just use boiled mashed potatoes in the same ratio, it will be nice. ahhh tried posting, it went missing.. here once more, wana try my first bread bake with ur recipe but where do i get potato flour in delhi? Thanks for visiting my blog. Yes, there are a lot of old and traditional recipes that go unnoticed. I live in a place where we have a lot of fruit trees and all the members of family inclined towards health food. A dad who always made jams from every seasonal fruit available, a grandmother who made kumaoni food, a mom who always struggled to ensure that we ate nourishing food. And now a husband who is also a health freak and loves to cook. Sangeeta, i just visited your blog and felt so nice reading health recipes and especially ragi bread. There is so much to learn and share. I have to take out time and read your posts in detail. I loved your posts. Am joining you! Can we use boiled tapioca root instead of boiled alu ? I Have never used Tapioca flour for breads so I wont be able to tell. Potato is so common it should not be a problem. In india we do not get potato flour. how can we replace it? Akanksha we do get potato four in India by the mane of alu mash powder. But this bread can be baked with boiled potato slurry as well. Please read the last para and follow the recipe. 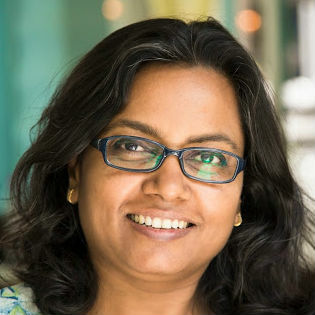 Prabha you would need lesser water if you use boiled potatoes, the flour quantity will remain the same.